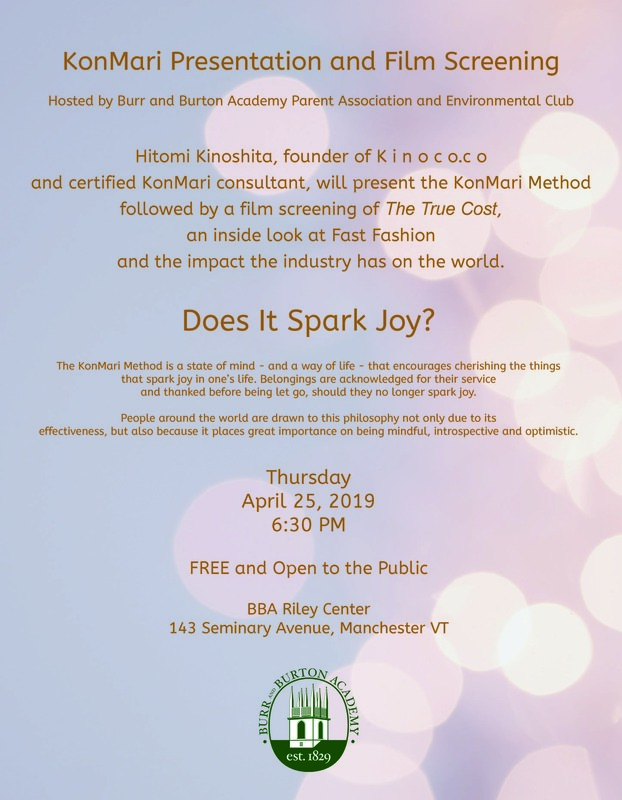 On Thursday, April 25th, 6:30 pm, Burr and Burton Academy Parent Association and the Environmental Club will host an event that unravels the complexity of clothing with a KonMari presentation followed by a screening of the documentary The True Cost. The KonMari method is the Japanese de-cluttering method that is featured on Netflix’s new show, Tidying Up. Hitomi Kinoshita, a certified KonMari consultant and founder of Kinoco.co will present the KonMari Method, which is a state of mind – and a way of life – that encourages cherishing the things that spark joy in one’s life. People around the world are drawn to this philosophy not only due to its effectiveness but also because it places great importance on being mindful, reflective and optimistic. Clothing is a necessity, but while it is an integral part of our lives, how much is too much? Fashion marketers overload us with new trends, too many choices, triggering a need that is sometimes real, or often times imagined. But rarely do we think about the process of how it was made or how it got to us. The True Cost examines the impact of the industry on people and the environment. The price of clothing has been decreasing for decades, while the human and environmental costs have grown dramatically. The True Cost is a groundbreaking documentary film that pulls back the curtain on the untold story and asks us to consider, who really pays the price for our clothing.